Great and unique apps are a big part of what has made the iPad such an amazing device, With that in mind, we offer up a quick review of one outstanding iPad app a week here each week. 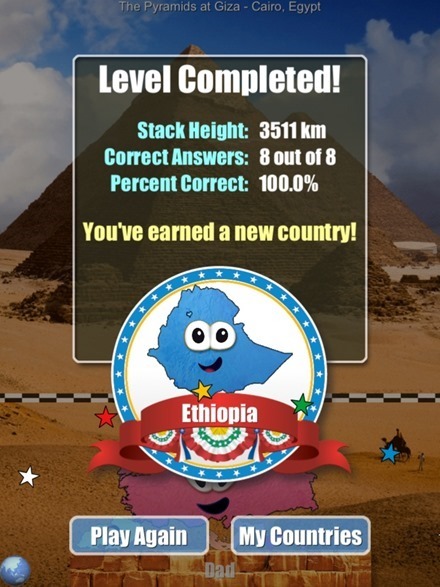 This week’s pick is Stack the Countries, a superb educational game that offers to make learning about the world fun. This could be considered the big brother of our winner from just a few weeks back – Stack the States. I love this app (and its little brother) because it’s easy and fun to use, delivers on its promise to make learning fun, and is a big hit with my 10 year old daughter. It’s an iPad game the two of us can enjoy together, and that’s always a good thing. This game is considerably more challenging than Stack the States, since it covers more than 190 countries around the world. And that’s great, because it helps to build up our kids’ and / or our own knowledge of all the other nations around the world. — Tap to move or rotate the country (so that it lands better and stays in place on the pedestal at the bottom of the screen). — Tap ‘Drop It’ to drop it into place on the pedestal. When your stack of countries gets high enough you level up and get rewarded with a random country to add to your My Countries list – with the ultimate objective being to collect all 193. The game tests your knowledge of capitals, landmarks, major cities, continents, border countries, languages, flags, and country shapes. ▸ 193 flash cards — one for each country! ▸ Earn FREE bonus games: Map It! and Pile Up! 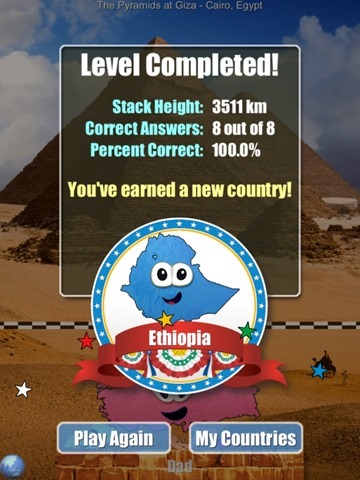 STACK THE COUNTRIES™: Build tall piles of countries and try to reach the checkered line. One more thing I really like about this game is that it does not require, or offer, any In-App purchases to enhance the game or advance through it more quickly. 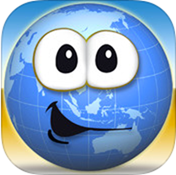 Here’s an App Store link for Stack the Countries; it’s priced at $1.99 and is a universal app designed for both iPad and iPhone. If you’re after more great iPad apps, be sure to check out our previous choices for Best iPad of the Week. We’ve also recently put together a best of the best of our free app selections in a Top 25 Best Free iPad Apps list.